The prestigious five-star luxury Hotel Villa Padierna in Marbella has launched a brand-new concept: Las Casitas del Hotel Villa Padierna. 11 private villas and 3 suites in the extensive and beautiful hotel gardens offer clients the maximum privacy of a second home in unique, elegant surroundings, with five-star hotel facilities and 24-hour butler service just a push of the button away. Championship golf course, stunning spa, pools, kids' club, restaurants, bars and superb business facilities on your doorstep. The Casitas de Villa Padierna consist of 8 two-bedroom villas of up to 647 m2, three one-bedroom villas of 90 m2 and three suites. Each villa has a reception room with fireplace, small kitchen, terraces and private pool. The three suites are beside the amphitheatre. The Casitas have a blend of stylish antique furniture and modern hi-tech facilities: plasma TV, music systems and high speed internet access. Romantic getaways, spa and chill-out breaks, golfers, families, business trips. Guests wanting a beachfront hotel. The hotel provides transfer service to the exclusive Villa Padierna Beach Club, opening 2010, less than 3 kms. distant. All accommodation features high speed internet access, three telephones, air conditioning, in-room safe, TV and CD player, travertine bath with double sink, rain shower, plush terry bathrobes, slippers, lighted makeup mirror, hair dryer, twice daily housekeeping service, 24-hour in-room dining, fully stocked minibar, iron and ironing board upon request, complimentary overnight shoeshine. July/August: Las Casitas Lounge, food service three times daily. 24-hour butler service. Shows in the Roman amphitheatre. Kids´ Club (supplementary charge). Entry to Villa Padierna Beach Club with complimentary transfers. All year round: Welcome amenity on arrival. Daily Thermae Spa Circuit. Daily buffet breakfast in the restaurant, in-room tea and coffee facilities. DVDs, video games and books for children. The Tower Villa lives up to its name: its 355m2 are distributed over three floors. 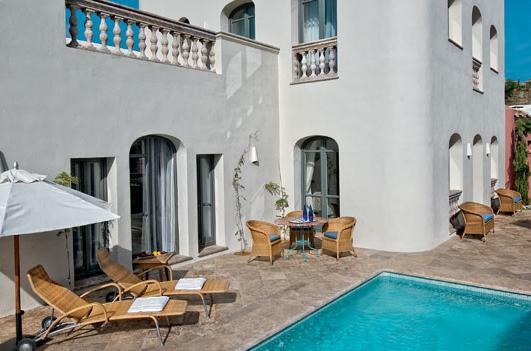 Two pretty bedrooms with ensuite bathrooms; private terraces and solarium, private pool. Living room with fireplace, DVD/CD/MP3 player and LCD flat screen TVs. Small, fully-equipped kitchen. Two ensuite rooms with five private terraces, one with solarium; private pool; two living rooms with fireplaces and DVD/CD/MP3 player and LCD flat screen TVs; two small fully equipped kitchens. 383m2. Two en-suite king-size bedrooms with terrace or sundeck; private pool/jacuzzi; living room with fireplace; small fully equipped kitchen. CD/DVD/MP3 player; LCD flat screen TVs. 265m2. Beautiful bedroom, large terrace/sun deck, private pool on request, living room with fireplace, CD/DVD/MP3 player, LCD flat screen TVs. Fully equipped small kitchen. 90m2. Two pretty rooms with private terrace, two en-suite bedrooms, living room with fireplace, DVD/CD/MP3 player, LCD flat screen TVs. Small fully-equipped kitchen. 250m2. Two rooms and three terraces with pergola and solarium; two ensuite bedrooms, living room with fireplace, DVD/CD/MP3 player and LCD flat screen TVs. Fully equipped small kitchen. 202m2. 2 ensuite rooms, living room with fireplace, DVD/CD/ MP3 player and LCD flat screen TVs. Small fully equipped kitchen. IN THE HOTEL: 2 18-HOLE GOLF COURSES: Los Flamingos, par 71 world championship course; Alferini, par 73. Men´s handicap 26; ladies´ 34. RACQUET CLUB: 6 paddle courts, 2 tennis courts, playground, mini football, bar, restaurant, sports shop, parking. Open daily 10:00-22:30. FITNESS CENTRE: Cardio and muscular training, comprehensive selection of appliances. Pilates, aquagym and stretching in the summer. KIDS´ CLUB (seasonal): Well-equipped facilities for kids 4-12. Dancing, singing, comedy sketches with costumes, stories, outdoor games, etc. Qualified supervisor. Full day 10:00-18:00, half day 10:00-14:00 or 14:00-18:00. OUTDOOR POOL in water gardens. OUTSIDE THE HOTEL: Check the Stylish Places to Stay Marbella City Guide. Delightful Roman-style spa with 21st century comfort. Dynamic indoor pool, plunge pool, Turkish bath. Aromatic Thermal Circuit with 8 themed steam and aromatherapy rooms. Orange- and lemon-scented showers, ice shower. Relaxation room. Full range of body massages and treatments. Mobile phone use not permitted. Children over 6 and under 12 may use facilities from 13:00-15:00 under supervision, max. 8 children. Reservations essential; charge made for cancellations within 24 hours of appointment. Beauty salon and barber shop: range of hair and beauty services. HOTEL VILLA PADIERNA: Championship golf course, spa, swimming pools, kids´ club (seasonal), restaurants, bars, business centre and top business and events facilities. TOWNS: Marbella 24 km/20 min. Puerto Banús 13 km/10 min. Ronda 58 km/45 min. Granada 208 km/2 h. Jerez de la Frontera 152 km/90 min. Sevilla 257 km/2 h 50 min. Cordoba 216 km/2 h 31 min. SHOPPING: El Corte Inglés department store, 10 min. La Cañada shopping mall, 20 min. Marbella old town centre 20 min. SPORTS: At the hotel and nearby: golf. 10 mins: Riding, tennis. 15 mins: Fishing and sailing, hiking, 4x4, quad, archery, diving, rock climbing, waterskiing, kayaking. 20 mins: Karting. 40 mins: parasailing. 45 mins: diving, kitesurfing, windsurfing, dolphin and whale watching by boat. 1 hr: Ascari Race Resort. 2½ hrs: skiing in the Sierra Nevada. FUN FOR KIDS: 5 mins: Selwo Adventure Park. 35 mins: Selwo Marine Park. 45 mins: Mijas Water Park. MALAGA airport: 81 km/1 hr 17 min from the Hotel Villa Padierna. GIBRALTAR: 64 km/63 min. If your departure is from Gibraltar, add 1 hr to your arrival time at the airport to compensate for possible traffic holdups. MALAGA: Train station Mar�a Zambrano, 59 min/76.4 km. The Hotel Villa Padierna will arrange private transport from Málaga airport on request. Taxis available at Málaga airport and train station; the 75-minute trip to the Hotel Villa Padierna costs approx 100 euros. Málaga airport has a car hire collection and drop-off point. Reservation recommended. Secure 24-hr parking is available at the Hotel Villa Padierna. See the Stylish Places to Stay Marbella City Guide and Top 10 Things to do and see in Andalusia. IN THE HOTEL: LA VERANDA, formal dining. Creative gourmet Basque/Andalusian fusion cuisine. Vegetarian menu, children´s menu. Reservations recommended. Open Tue-Sat 20:00-23:00. LA LOGGIA, cafeteria and casual dining. Regional Spanish and international cuisine. Children\'s menu. Open daily 07:30- 23:30. EDDY´S BAR, traditional English club atmosphere. Smoking permitted. ROOM SERVICE: 24 hrs, children´s menu. LA CANTINA DEL GOLF, sandwiches, snacks and drinks throughout the day. OUTSIDE THE HOTEL: Ask the concierge for suggestions and recommendations. Check the Stylish Places to Stay Marbella City Guide.